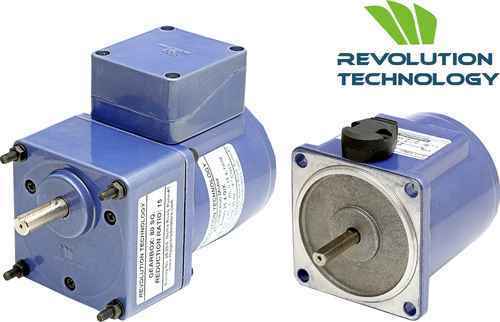 Reversible Motors:Revolution Technology, Pune offers the Reversible Motors. The range consist of 25 Watt Reversible Motors, 40 Watt Reversible Motors, 60 Watt Reversible Motors, 90 Watt Reversible Motors, 180 Watt Reversible Motors, 200 Watt Reversible Motors, 360 Watt Three phase Reversible Motors. All our Reversible Motors are in Aluminium pressure die cast materials. We are using special graded materials which will give better life for the motor. All our motors are CNC machined so accuracy and performance will be always better. Our stamping and rotor materials are even best quality and imported one so the efficiency is highest in class.Gearboxes are also pressure die casted aluminium graded materials and all are go through VMC process. All our gears are metallic and CNC hobbed with proper hardening process. All shafts are CNC machined and plated with proper chemicals. In Pune Revolution Technology is established in 2003. Our customers are spread all over India. 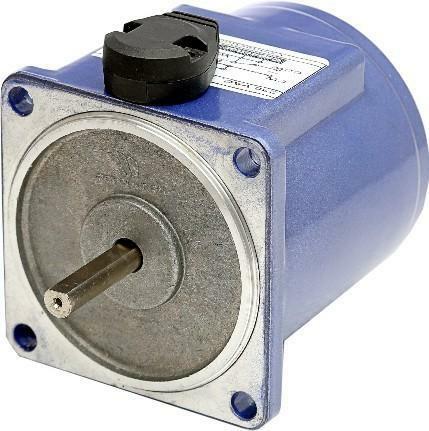 Pune, Mumbai, Delhi, Hyderabad, Chennai, Jaipur, Bangalore, Gujarat, Karnataka, Utter Pradesh all are the major market.Further our company is engaged in manufacture ring of AC FHP motors also.Its a range is 25 Watt Reversible AC Geared Motor, 40 Watt Reversible AC Geared Motor, 60Watt Reversible AC Geared Motor, 90 Watt Reversible AC Geared Motor, 180 Watt Reversible AC Geared Motor, 200 Watt Reversible AC Geared Motor, 360 Watt Reversible AC Geared Motor. 25 Watt Reversible motors- A reversible motor (can reversible Motors direction) is an electric motor with a rated output power of 25 Watt Reversible Motors. There is no defined minimum output, however, it is generally accepted that a motor with 25 Watt Power Or less or a frame size 80 mm square can be referred to as a Reversible Motor. The term 'reversible motor' indicates that the motor motor which can be run both the directions ie. forward and reverse. It is ment for the short duty applications. We can obsolete the overrun without em brake in such kind of motors. Brake pack is mounted on the back side of the motor and it stops the motor immediately. So we can avoid the over run of the 25 Watt Reversible motor. Uses of 25 Watt Reversible Motor: Use of 25 Watt Reversible Motors in the machines where you don't needs the over run of the motor shaft without any mechanical brake or electromagnetic brake. Applications of 25 Watt Reversible Motors / 25 Watt Reversible Geared Motors: Special Purpose Machines, Food machines, Conveyors, Printing machines, etc. There aren't any insights for this post yet. Check back soon. 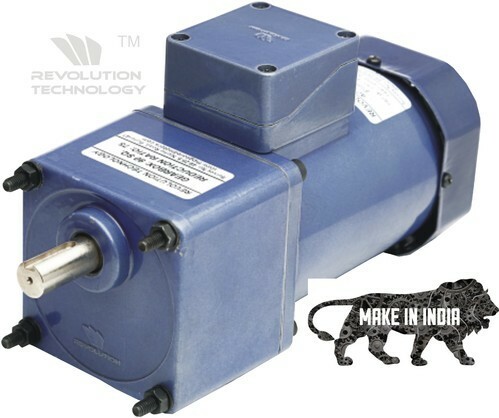 Revolution Technology, Pune offers the Reversible AC Geared Motors. The range consist of 25 Watt Reversible AC Geared Motors, 40 Watt Reversible AC Geared Motors, 60 Watt Reversible AC Geared Motors, 90 Watt Reversible AC Geared Motors, 180 Watt Reversible Three Phase AC Geared Motors, 200 Watt Reversible Single phase AC Geared Motors, 360 Watt Reversible Three phase AC Geared Motors. All our AC Reversible Motors are in Aluminium pressure die cast materials. We are using special graded materials which will give better life for the motor. All our motors are CNC machined so accuracy and performance will be always better. Our stamping and rotor materials are even best quality and imported one so the efficiency is highest in class. Gearboxes are also pressure die casted aluminium graded materials and all are go through VMC process. All our gears are metallic and CNC hobbed with proper hardening process. All shafts are CNC machined and plated with proper chemicals. In Pune Revolution Technology is established in 2003. Our customers are spread all over India. Pune, Mumbai, Delhi, Hyderabad, Chennai, Jaipur, Bangalore, Gujarat, Karnataka, Utter Pradesh all are the major market. Reversible motors are ment for the short duty applications. It will minimise the over run of the motor. It is an Induction Gear Motor which is also called as 90 Watt Reversible Geared Motor. Its output power is 90 Watt Reversible Geared Motor ie 1/8th Horse Power (HP). 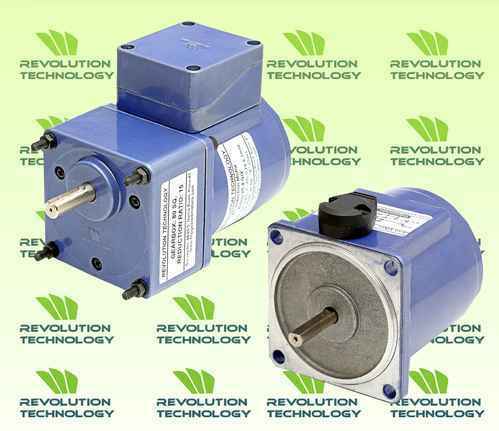 Revolution Technology, our company manufacturers of these 90 Watt Reversible Geared Motor. 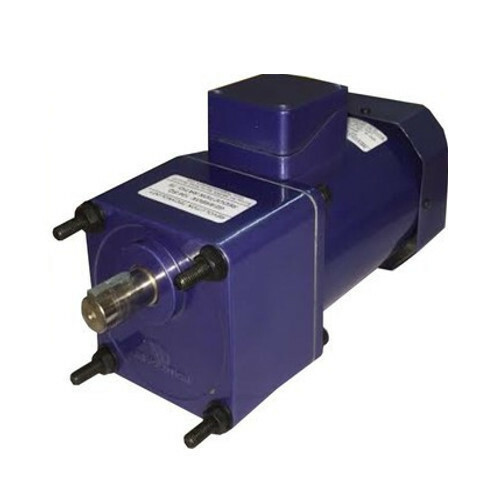 The 90 Watt 90 Watt Reversible Geared Motor Gear Motors comes with four types of different supply voltages. These are 110 Volt AC-Single Phase, 230 Volt AC-Single Phase, 230 Volt AC-Three Phase, 415 Volt AC-Three Phase, Continuous Rating, TE Aluminium Die Cast Body. 200 Watt Gear Motor can rotates in clock wise or counter clock wise direction. Over runs after few rotations after supply is cutt off. Speeds are 2880 / 1440 and further low speeds with the gearbox.Terminal box or open lead wires for connections. In 200 Watt Gear Motor we can further reduce the basic speed of the motor by attaching the gearbox with the motor. 200 Watt Gear Motor come in 104 mm square frame size. The gearbox suitable for the 200 Watt Gear motor is Gearbox with square 104 mm. 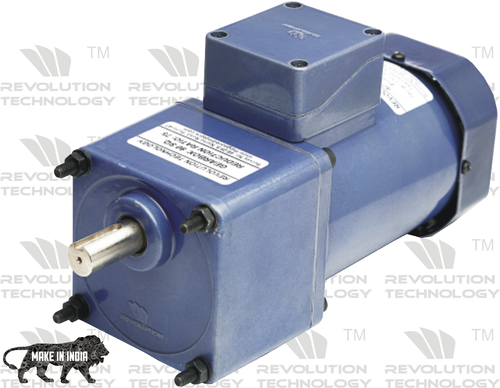 In 200 Watt AC Gear Motor Revolution Technology offers reduction ratios 3 to 180 (20 types). 200 Watt Gear Motor. Motors can be useful for the different industrial applications like stirrers, tablet dissolution machines etc. 25 Watt AC Reversible Geard Motor, 40 Watt AC Reversible Geard Motor, 60 Watt AC Reversible Geard Motor, 90 Watt AC Reversible Geard Motor, 180 Watt AC Reversible Geard Motor, 200 Watt AC Reversible Geard Motor & 360 Watt AC Reversible Geard Motor. Our sourdough professionals and decades of field experience have allowed us in offering an exclusive range of 25 Watt FHP Motor, 40 Watt FHP Motor, 60 Watt FHP Motor, 90 Watt FHP Motor, 180 Watt FHP Motor, 200 Watt FHP Motor, 360 Watt FHP Motor. We are leading supplier of Compact sized motor. 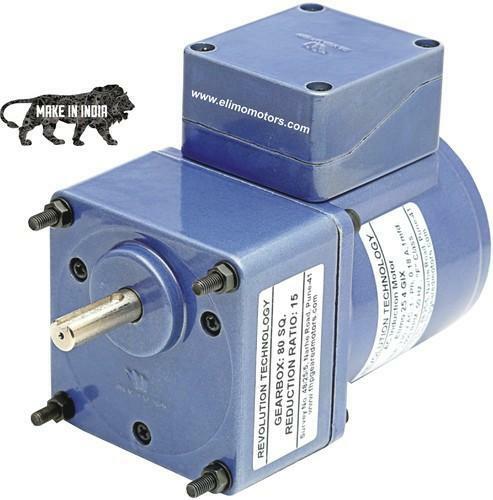 We obligated to meet the quality standards as per the customer demand.Reversible Motor Reversible Motors:Revolution Technology, Pune offers the Reversible Motors. The range consist of 25 Watt Reversible Motors, 40 Watt Reversible Motors, 60 Watt Reversible Motors, 90 Watt Reversible Motors, 180 Watt Reversible Motors, 200 Watt Reversible Motors, 360 Watt Three phase Reversible Motors. All our Reversible Motors are in Aluminium pressure die cast materials. We are using special graded materials which will give better life for the motor. All our motors are CNC machined so accuracy and performance will be always better. Our stamping and rotor materials are even best quality and imported one so the efficiency is highest in class.Gearboxes are also pressure die casted aluminium graded materials and all are go through VMC process. All our gears are metallic and CNC hobbed with proper hardening process. All shafts are CNC machined and plated with proper chemicals. In Pune Revolution Technology is established in 2003. Our customers are spread all over India. Pune, Mumbai, Delhi, Hyderabad, Chennai, Jaipur, Bangalore, Gujarat, Karnataka, Utter Pradesh all are the major market.Further our company is engaged in manufacture ring of AC FHP motors also.Its a range is 25 Watt Reversible AC Geared Motor, 40 Watt Reversible AC Geared Motor, 60Watt Reversible AC Geared Motor, 90 Watt Reversible AC Geared Motor, 180 Watt Reversible AC Geared Motor, 200 Watt Reversible AC Geared Motor, 360 Watt Reversible AC Geared Motor. Reversible motors- A reversible motor (can reversible Motors direction) is an electric motor with a rated output power of 90 Watts. There is no defined minimum output, however, it is generally accepted that a motor with a frame size of less than 90 mm square can be referred to as a Reversible Motor or Micro-motor. The term 'reversible motor' indicates that the motor motor which can be run both the directions ie. forward and reverse. It is ment for the short duty applications. We can obsolete the overrun without em brake in such kind of motors. Brake pack is mounted on the back side of the motor and it stops the motor immediately. So we can avoid the over run of the motor. Uses of Reversible Motor: Use of Reversible Motors in the machines where you don't needs the over run of the motor shaft without any mechanical brake or electromagnetic brake. Applications of Reversible Motors / Reversible Geared Motors: Special Purpose Machines, Food machines, Conveyors, Printing machines, etc. There aren't any insights for this post yet. Check back soon. We are actively engaged in fabricating and supplying superior quality assortment of 180 Watt Reversible Motor that is widely used in the various electrical industries. Manufactured using high grade factor inputs and latest technology in compliance with the international quality standards, these are available in various specifications as per the varied requirement of clients. The offered motors are appreciated among clients due to their corrosion resistance, rugged construction and high tensile strength. With the assistance of our team of professionals, we are engaged in manufacturing and supplying a wide gamut of 15 Watt Reversible Motors. It is fabricated using high grade factor inputs and the most-modern technology to meet the international quality standards. Some of the salient features of this motor are rust resistance, high performance, and smooth operation and longer service life. These motors include a single phase and three phase reversible motors. These single phase motors works on capacitor-start capacitor-run principal, these are squirrel cage motors. The output speed ranges are: 1440 (4 Pole) and 2880 (2 Pole). In reversible motors we can minimize the overrun of the motor. The reversible motors are with lead wires or with terminal box. 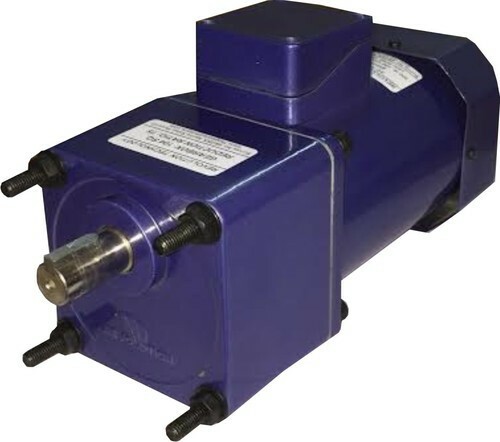 Reversible motors are suitable for the short duty applications only. These motor rotate in clockwise or anti clockwise direction. Frame sizes are square frame 65 mm, square frame 80 mm, square frame 90 mm and square frame 104 mm. Featuring rust resistant and high performance finish, these 360 Watt Reversible Motor options provide for smooth working operations as well as longer service life. Made available in options of single/three phase options, these run on capacitor-start capacitor-run principal and come with output speed range of 1440 (4 Pole) and 2880 (2 Pole). Further, the operating speed of the motors can also be further reduced through gearbox support provided in the motors. Some of its advantages include supporting minimized overrun of motor, coming with support of lead wires/terminal box, suitable for clockwise/anticlockwise direction, availability in different frame size choices and output power support and motor with D-shaft and with pinion shaft options.